A parking warden 'antagonised' a driver and gave him two £60 parking fines while he was delivering implants for an urgent hospital operation. 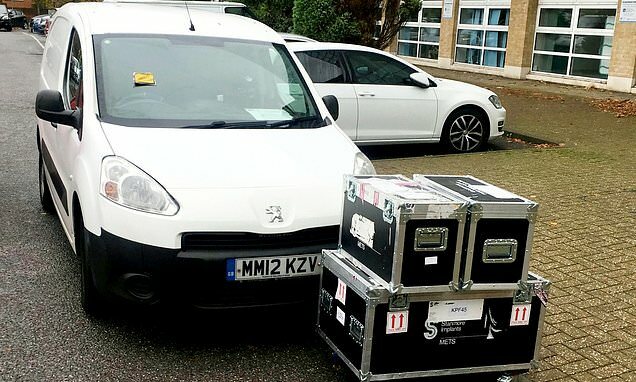 Anthony Fleetwood parked outside the renal unit at Wycombe General Hospital to deliver crucial components for surgery when the 'jobworth' warden allegedly told him to park in a bay. But when the 54-year-old came back to the van he realised he had been given a ticket - the second fine from the same warden in two days. Mr Fleetwood said the warden 'had it out for him' and that delivery drivers are forced to pay to park because there are no spaces or designated loading bays at the hospital. The courier driver, who delivers to dozens of hospitals, was working on behalf of orthopaedic company Stanmore Implants which creates technology for saving patients joints by attaching prosthetic limbs. Mr Fleetwood, who has been making deliveries for 30 years, said: 'I was so angry because that attendant is the one that told me to park in the bay in the first place. 'He had it out for me.